In practice reversibility of neutralization applies to the dissociation of virus-antibody aggregates into single virus particles bound to antibody and to the dissociation of antibody from the latter (Fig. 3); for further discussion see Fazekas de St. Groth 1962; Hornick and Karush (1972); Blank et al. (1972) and Day (1990). Reversibility depends upon the dissociation constant and the concentration of antibody. Many IgGs have high affinity and their bivalent character increases their avidity by 1000-fold; consequently, their rate of dissociation (KD2) is low (poliovirus, Mandel 1961; Brioen et al. 1985a; NDV, Rubin and Franklin 1957). Dilution dissociation of poliovirusantibody complexes, after they were diluted 10,000-fold and held at 37°C for 5 h, was negligible for both antiserum and two mabs (Brioen and Boeyé 1985). This is in contrast with the ready dilution-dissociation of influenza virus-Fab complexes (Lafferty 1963b; Sect. 19). Antibody produced early in infection is of low avidity (Webster 1968). Avidity increases as immunogen concentration falls due to the selective stimulation of B cells. However, Rosenstein et al. (1971) found no difference in dissociation of Fabs from the bacteriophage φX174 whether they were derived from neutralizing early antiserum or late antiserum, although only Fabs from late antiserum were neutralizing. Reactivation can occur by adding an excess of inactivated homologous virus. 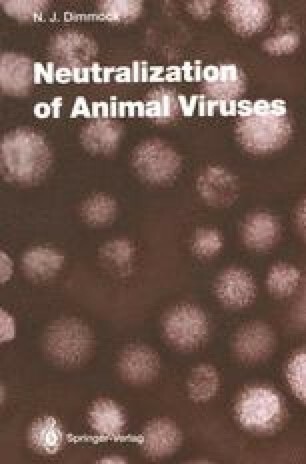 This probably results from the collision of a neutralized virus-antibody complex with inactivated virus which allows transfer of antibody and restoration of infectivity (influenza virus, Isaacs 1948; western equine encephalitis virus, Dulbecco et al. 1956). Most published work (reviewed by Svehag 1968) precedes the advent of mabs and therefore has the intrinsic uncertainties inherent in the heterogeneous nature of a polyclonal antibody preparation. Poliovirus infectivity was recovered when virusantiserum mixtures were treated with fluorocarbon (Svehag 1963) or by freezing and thawing (Mandel 1973). Recovery of infectivity decreased with time of incubation of virus and antibody, suggesting that more stable molecular interactions were being formed. Incubation with a monoclonal IgG gave no reactivation of infectivity (Icenogle et al. 1983). In principle, dissociation from virus will be proportional to the avidity of individual mabs. However, criteria used in screening may tend to select mabs with high affinities (around 109M−1); even so, mabs to influenza virus used by Brown et al. (1990) ranged in value from 106.8 to 109.5 M−1 Interestingly, they found no correlation between affinity and neutralization. The infectivity of diluted TGEV-mab complexes was dramatically increased by 103–106-fold after holding at 4°C for 3 h, presumably by dissociation (Suñé et al. 1990).